The sight of people hugging has become a commonplace, almost inescapable, feature across popular media in the UK. For reality TV programmes such as the X-Factor a show is not complete without outbursts of tears and copious hugging. 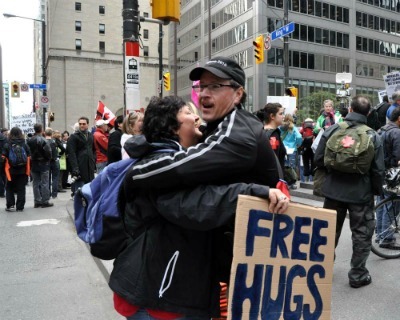 Hugs have also become a visible feature of the Occupy movement. From Wall Street to Amsterdam; London to Brazil, groups of people can be found amongst the occupy protesters brandishing signs reading 'Free Hugs'. The Free Hugs Campaign was initiated several years ago with the purpose of going out into the streets of towns and cities offering hugs for free. As the Free Hugs Campaign has grown in popularity the 'hug' has emerged as both an action and symbol that serves to counteract the isolation and alienation of modern life. The promotion of hugs has been further supported by the increasing political interest in happiness and well-being. Happiness is presented by organisations such as Action for Happiness as the antidote to the obsession with wealth and materialism that has caused a global economic crisis and increasing public unrest. The ubiquity of the hug has set certain standards about how we should display our feelings and what our ability to show our emotions says about us as human beings. The hug is regarded as an action that is a necessary and natural part of being human. If an individual fails to engage in the hugging etiquette they are considered abnormal. Hugging has become a normative requirement. The hug is an attempt to transcend the binds of day-to-day life but as a social obligation, it has become another duty, rather than a liberation from repression. The hug is perceived as a means to reconnect with our 'true' human selves and form solidarity with each other. Hugs are designed to make us feel good and special by protecting us from negative thoughts and feelings. But they can also be about the reinforcement of a repressive sense of belonging and inwardness. It’s also interesting to note that, as well as being a symbol of emotional liberation and authentic self-expression, the hug is also a physically restrictive position. The vision of open arms is a sign of comfort and reassurance. But equally, arms can hold us in a tight grip, creating a boundary between ‘us’ and ‘them’, those who belong, and those who don’t. Zizek has warned the Occupy protestors of the danger they might fall in love with themselves (read his article here) – and it’s arguable that gestures of mutual belonging and self-congratulatory reciprocity, like hugging, can be symptoms of a narcissistic political culture. Of course, from time to time we all need a hug. But the idealism of the Free Hugs Campaign can lead to the idea that a quick feel-good fix can solve everything. For this reason it’s curious to see how the campaign has been incorporated so easily into the Occupy movement, despite its radical demands. An over-reliance on the symbolism of the hug, and other quick feel-good fixes, as a manifesto for making the world a better place, can blind us from seeing the complexity, and experiencing the discomfort, of facing political and societal problems. This reminds me of ‘Amma’ the hugging guru in India. http://en.wikipedia.org/wiki/Mata_Amritanandamayi. I think there is something interesting about embodiment and physicality in mass movements, creating a solidarity on a level that is different to pure ideology. It brings to mind the images of the San Diego students huddling together and being pepper sprayed. Hugging seems a bit silly in this context, but this is probably due to my English reserve. But this post has made me consider the physicality of political protest. I like that idea Louise – you may be on to something there! I think, in response to ‘Free Hugs’, we should set up a counter-movement called ‘Free Analysis of Hugs’ – in which we talk about the underlying meaning of hugs to random passers-by! Piyul- thank you for your comments, India presents a fascinating paradox. The hug is a common and comfortable greeting in North India, but there appears to be quite a difference with the South. I think there is definitely something to ‘not-hugging’ as a defense mechanism, but in a country where you are constantly being rubbed up against people on public transport, or elbowed in the markets – and where privacy is a luxury – it is a curious contradiction. Though London is also very similar, packed into the tube with strangers – so physically close and yet so distant. The Free Hugs Campaign actually does exist in India – suffice to say it is limited to the young generation and to big cities – Mumbai, Chennai etc. A ‘quick feel-good fix can solve everything’ – that is the nub of the matter, isn’t it? That’s an interesting analysis. Funny how there are cultural codes and barriers hidden even within the ‘hug’. In the Middle East, it is popular – amongst the same gender. In India, if you did not take Bollywood as representing real life – traditionally, the hug is seen as something you do to young children to pacify them, or to express parental/ filial love, and among adults, only if lovers – in private. So even when friends meet, there is a high-five, holding of hands, but a hug was not the default mode of welcome earlier. The upper classes have begun the hug-way of saying hello, learnt from the West undoubtedly, with the accompanying mooahs, but precisely for this base of suers, the hug as a welcome is seen as a very very ‘modern’ symbol of reciprocity. With the younger gen gradually taking to it. At the same time, can’t see the ‘free hug’ concept taking off even in the campuses of young India. Why? Cause it will most likely be used by the repressed and the abnormal, to reach out and touch the opposite gender – read women! Perhaps ‘not-hugging’ is also a defense mechanism in a country that is so very crowded that it leaves no elbow space in any case, and any bodily touch is tolerated rather than welcomed.